When Ronald Nau bought a five dollar lottery ticket, he didn’t really have much of a choice. There was only one ticket in the machine and a long line of people waiting for their turn. But the situation proved beneficial for him as he won the top $1 million prize. He had bought the ticket at the Wegmans store on Mt. 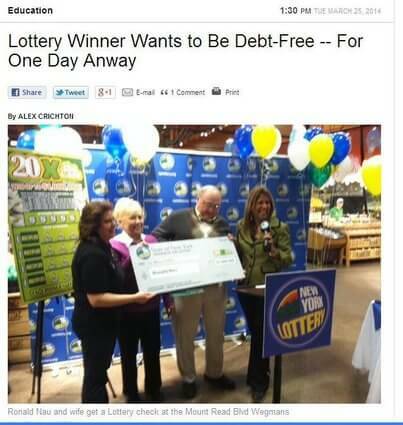 Read Boulevard, so the lottery officials awarded his $1 million win from the “20X the Cash” game there. Nau jokingly claims that his wife married him for the money which, by the way, came only 42 years late. After deciding to take a lump sum payment of $555,912, the couple decided to do ‘crazy things’, including a second honeymoon with their windfall. And they want to wake up debt-free if only for a day.